Correspondence to: Bonghee Lee, Center for Genomics and Proteomics & Stem Cell Core Facility, Lee Gil Ya Cancer and Diabetes Institute, Gachon University, 155 Gaetbeol-ro, Yeonsu-gu, Incheon 21999, Korea, Tel: +82-32-899-6582, Fax: +82-32-899-6519, E-mail: bhlee@gachon.ac.kr. Kyunghee Byun, Center for Genomics and Proteomics & Stem Cell Core Facility, Lee Gil Ya Cancer and Diabetes Institute, Gachon University, 155 Gaetbeol-ro, Yeonsu-gu, Incheon 21999, Korea, Tel: +82-32-899-6511, Fax: +82-32-899-6519, E-mail: khbyun1@gachon.ac.kr. Received November 15, 2018; Revised December 21, 2018; Accepted December 23, 2018. Parkinson’s disease (PD) is a fatal and progressive degenerative disease of the nervous system. Until recently, its promising treatment and underlying mechanisms for neuronal death are poorly understood. This study was investigated to identify the molecular mechanism of neuronal death in the substantia nigra and corpus striatum of PD. The soluble RAGE (sRAGE) secreting Umbilical Cord Blood—derived Mesenchymal Stem Cell (UCB-MSC) was generated by gene editing method using clustered regularly interspaced short palindromic repeats/CRISPR associated protein 9 (CRISPR/Cas9). These cells were transplanted into Corpus Striatum of rotenone-induced PD animal models then behavioral test, morphological analysis, and immunohistochemical experiments were performed to determine the neuronal cell death and recovery of movement. The neuronal cell death in Corpus Striatum and Substantia Nigra was dramatically reduced and the movement was improved after sRAGE secreting UCB-MSC treatment in PD mice by inhibition of RAGE in neuronal cells. We suggest that sRAGE secreting UCB-MSC based therapeutic approach could be a potential treatment strategy for neurodegenerative disease including PD. Parkinson’s disease (PD) is a fatal neurodegenerative disease caused by various factors such as genetic or sporadic causes with toxic drugs etc. Patients suffering from PD have movement disorder due to chronic progressive destruction of the nervous system in several areas of the brain. When Lewy bodies are formed in substantia nigra (SN) area, dopaminergic neuron (DA) cells are facing apoptosis (1–3). Since substantia nigra and corpus striatum (CS) are linked together, DA cells in SN are sending signals to CS by producing dopamine. Therefore, when apoptosis of DA cells happens at the area of SN, there is no dopamine production from SN, so CS has no signal to react for movement and if this issue continued, then this area would get damaged by disuse atrophy (4, 5). One of the most popular and typical treatment is drug treatment, which provides L-3,4-dihydroxyphenylalanine (L-DOPA) or dopamine agonists at an early stage of PD. Due to these limitations of PD treatment, there have been many stem cell studies showing new therapeutic effects such as neural stem cells, induced pluripotent stem cell (iPSC)-derived dopaminergic neurons, or mesenchymal stem cells, etc (6–8). These stem cell treatments mostly showed better recovery compared to L-Dopa and deep brain stimulator and it becomes one of most successful therapies against PD until now. However, the effects still need to improve and show a clear mechanism for the recovery was shown such as a toxin, or neuronal mechanism, etc. Umbilical Cord Blood-derived Mesenchymal Stem cells (UCB-MSC) were chosen for the PD treatment in this study because UCB-MSC is well known with its superior characteristics as therapeutic material with anti-inflammatory effects (9, 10). We recently published that Advanced Glycation End-products-albumin (AGE-albumin) from activated microglial cells is one of the main causes of PD and its inhibition with soluble Receptor for AGEs (sRAGE) can be a good treatment strategy (11) through anti-inflammatory effects. We also hypothesized that continuous supplying of sRAGE can have better protective effects on neuronal death both in the substantia nigra and corpus striatum as primary and secondary order neuronal accumulations. Finally, this study was performed to investigate whether sRAGE secreting UCB-MSC by CRISPR/Cas9 method can protect the neuronal cell death in CS and SN of PD animal models. The animal experiment was performed in the CACU (Center of Animal Care and Use) of LCDI (Lee Gil Ya Cancer and Diabetes Institute) of GACHON University. Eight weeks old male C57BL/6N mice (20~25 gm) were randomly divided and housed into 5 mice per cage under a temperature-controlled environment with a 12 hours light/dark cycle, free access to food and water. All the animal protocols described in this study were approved by the CACU animal center ethical board. To establish suitable PD model, 30 mg/kg of rotenone (Sigma-Aldrich) which is suspended in 0.5% CMC was treated orally once in a day for 2 months. UCB-MSCs were grown in α-MEM medium (DMEM, Gibco® Life Technologies Corp.) supplemented with 10% fetal bovine serum (FBS, Gibco® Life Technologies Corp.) and 1% Penicillin and streptomycin (Sigma-Aldrich). These cells were maintained at 37°C in a humidified air under 5% CO2. Cells were subcultured at 80% of confluence. To generate sRAGE secreting UCB-MSC, transfection was done with CRISPR/Cas9 ribonucleoprotein system (ToolGen, Inc.) which is targeting safe harbor site known as adeno associated virus site 1 (AAVS1). Donor vector was purchased from Sigma Aldrich (pZDonor-AAVS1 Puromycin vector, PZD0020). Inside multiple cloning sites of donor vector, the sRAGE construct was placed by restriction enzyme digestion. EcoRI and NotI restriction sites were successfully used to generate complete donor vector for knock in. This insert consists of human elongation factor 1-alpha (EF1-α) promoter, sRAGE coding sequence and poly A tail. The nucleofection was performed with 4D nucleofector (Lonza). 15 μg of Cas9 protein, 20 μg of gRNA and 1 μg of donor DNA were prepared for 2×105 cells. Cas9 protein and gRNA were incubated for 15 minutes at room temperature before transfection was performed. P3 kit (Lonza, V4XP-3024) was used to perform efficient transfection. After 15 minutes, 4D nucleofector was set in conditions of FF-104 code (Lonza provided). Cells were seeded after transfection in 6 well plates and each contains 8×105 cells. After one month of rotenone oral injection, animals were randomly divided into 2 groups: PD and sRAGE-MSC. Animals were anesthetized with 3:1 ratio of Zoletil 50 (Virbac) and Rompun (Bayer Korea) by 1 ml/kg intraperitoneally prior to surgical procedures. The injection was performed with unilateral administration of drugs into the right CS (anterior and posterior 0.4, medial and lateral 1.8, dorsal and ventral from Bregma 3.5 mm). 1×106 Cells were prepared in 10μl of α-MEM medium without fetal bovine serum (FBS) and antibiotics. Perfusion was performed under the anesthesia through the heart with 50 ml 1XPBS followed by 50 ml cold fixative consisting 4% paraformaldehyde (PFA). After perfusion, the brain was removed and post-fixed for 5 hours in 4% PFA then stored overnight in 20% sucrose solution. Cryoprotected brain blocks were cut into 10 μm slices on a cryostat. Frozen sections of mouse brain were washed with 1XPBS 5 times and non-specific binding of antibodies was blocked by normal horse serum (Vector Laboratories). Tissues were incubated with protein-specific antibodies (Table 1) for overnight at 4°C, and then samples were washed with 1XPBS, followed by a secondary antibody incubation step at room temperature for 1 hour. For counterstaining of the nucleus, samples were stained with DAPI (4′6-diamino-2-phenylindole; 1 μg/ml, Sigma-Aldrich) for 20 seconds. After washing with 1XPBS, coverslips were mounted on a glass slide using Vectashield mounting medium (Vector Laboratories) and analyzed by using an LSM710 confocal microscope (Carl Zeiss). Frozen sections of mouse brain were dried at room temperature for 5 minutes and washed with 1XPBS for 5 times, then incubated in graded ethanol (95% ethanol 15 minutes, 70% ethanol 1 minute, 50% ethanol 1 minute). After washing with distilled water, the brain tissues were stained with 0.5% cresyl violet acetate (Sigma-Aldrich) solution for 12 minutes and passed through distilled water (1 minute), 50% ethanol (1 minute), 70% ethanol (2 minutes), 95% ethanol (2 times 2 minutes), 100% ethanol (1 minute) and finally cleaned with xylene (5 minutes). Stained slides were mounted with DPX mounting medium for histological analysis (Sigma-Aldrich). Brain tissues were prepared with RIPA lysis buffer (AMRESCO) and added 1x protease inhibitor (ROCHE) followed by sonication. The tissues were centrifuged at 14000 X g for 20 minutes at 4°C. Total protein concentration was measured by BCA (Life Technologies) according to the manufacturer’s method. Equal amounts (20 μg) of proteins were separated on 10% polyacrylamide gels (Life Technologies) and transferred to PVDF membrane (Millipore Corp.). Proteins were detected with protein-specific antibodies (Table 1). ECL (Animal Genetics Corp.) detection reagent was used to visualize the immunoreactivity proteins on the membrane. Cell activity was measured by (3-(4,5-dimethylthiazol-2-yr)-5-(3-carboxylmethoxyphenyl)-2-(4-sulfophenyl)-2H-tetrazolium, inner salt) (MTS) assay (Ez-Cytox cell viability assay). 2×103 of SHSY5Y cells are seeded in each 96 well plate. After seeding, cells were treated with AGE-Albumin (50 nM) during 12 hours. Co-treated cells were incubated with an sRAGE secreting UCB-MSC conditioned medium for 1 hour before AGE-Albumin treatment and incubated for 12 hours. MTS was performed according to the manufacturer’s protocol. The intensity of staining in the culture medium was measured by a spectrophotometer (450 nm) and presents the proportion of living cells. Paraffin-embedded heart tissues were deparaffinized in xylene for 10 minutes at room temperature and washed in 1X PBS for 5 times then incubated with permeabilization solution (0.1% Triton X-100 (Amresco), 0.1% Sodium citrate (Sigma-Aldrich), freshly prepared 2 minutes on ice. After permeabilization, tissues were rinsed 3 times with 1XPBS. TUNEL reaction mixture (Roche) was added to tissues and incubated in a humidified atmosphere for 1 hour at 37°C in the dark. Tissues were washed again in 1XPBS 3 times and coverslips were mounted onto glass slides using the Vectashield mounting medium (Vector Laboratories). Human soluble receptor for advanced glycosylation end products (sRAGE) ELISA kit (Aviscera Bioscience) was used to quantify the amount of secreted sRAGE. The samples and standards were loaded in a pre-coated 96-well microplate and incubated for 2 hours at room temperature. After washing the wells four times with washing buffer, 100 μl of detection antibody was added to each well and incubated at room temperature. After 2 hours of incubation, the wells were rinsed for four times with washing buffer and then 100 μl of ARIG-HRP conjugated working solution was added to each well incubated at room temperature for 1hour at room temperature. After washing the plate with washing buffer, 100 μl of Substrate solution to each well followed by incubating for 10 minutes at room temperature. Finally, 100 μl of Stop solution added each well and optical density was determined at 450 nm. Rotarod test, using an accelerating rotarod (UGO Basile Accelerating Rotarod), was performed by placing mice on rotating drums (3 cm diameter) and measuring the time that each animal was able to maintain its balance on a rod. The speed of the rotarod was 15~16 rpm. Pole test was performed with the stick attached on the floor (diameter: 1 cm, height: 35 cm). Mice were placed on the top of the stick facing to the floor and measure the time when they reached to bottom. Before the time measurement, two training trials were done then it started measuring the third time. Each mouse has three times of trials. All experimental data were presented as the mean±standard deviation (SD). Statistical significance was evaluated using Student’s t-test and p≤0.05 was considered as significant. For investigating the involvement of activated microglial cells in PD, we performed triple immunostaining against AGE, albumin, and Iba-1 (activated microglial cell marker). AGE-albumin was localized in activated microglial cells after triple staining in Corpus striatum in mouse PD model (Fig. 1A). However, no labeling was observed in control. Triple labeling was observed 14.4 folds significantly higher in striatum area of PD model compared to control mouse model. Co-localization coefficient was around 5% in control and 72% in PD model as shown in the bar graph (Fig. 1B). For the generation of sRAGE secreting UCB-MSC, pzDonor vector, CRISPR gRNA and Cas9 proteins were delivered together by Neon transfection system (Fig. 2A~C). This insert consists of human EF1-α promoter, sRAGE coding sequence and poly A tail (Fig. 2B). Finally, the gene of sRAGE successfully integrated into AAVS1 (Fig. 2C) and the cells start generating sRAGE proteins. sRAGE secretion was measured by western blotting with Flag-antibody which can detect only protein from the successfully transfected vector. Only sRAGE secreting UCBMSC with pzDonor transfection has an expression of Flag (Fig. 2D). To determine the secretion level of the whole sRAGE in the medium, ELISA was performed. 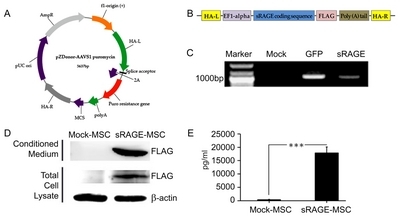 In conditioned medium from sRAGE secreting UCB-MSC, 17870.9 pg/ml of sRAGE was detected. However, medium from mock-MSC has 389.37 pg/ml of sRAGE expression (Fig. 2E). To check the protective effect of sRAGE secreting UCBMSC, immunohistochemistry and TUNEL staining were employed. The expression of RAGE increased after AGE-albumin treatment in neuronal cells compared to the control group. However, the expression was decreased after treating with conditioned medium (Fig. 3A, Supplementary Fig. S1). TUNEL (apoptotic cell marker) positive cells were also increased after AGE-albumin treatment compared to control group. However, the expression was decreased after treating with conditioned medium (Fig. 3A, Supplementary Fig. S2). To prove the protective effect of sRAGE on cell death, MTS assay with neuronal cells was performed. As a result, MTS assay showed that AGE-albumin treatment induced cell death and the viability of cell was significantly decreased from 96% to 82% (Fig. 3B). However, the viability of co-treated group with AGE-albumin and conditioned medium remained similar to a control group. Human neuronal cells were treated with AGE-albumin or AGE-albumin co-treated with conditioned medium from sRAGE secreting UCB-MSC to detect the mechanism of cell death trough RAGE-related mitogen-activated protein kinases (MAPK) pathway. The result shows that the expressions of pp38 and pERK were upregulated after treatment of AGE-albumin and decreased after co-treatment with AGE-albumin and conditioned medium. The expression of pJNK was increased by AGE-albumin treatment. However, it remained the same even after co-treatment with AGE-albumin and conditioned medium. Also, the expression of Bax was increased after AGE-albumin treatment. However, if the conditioned medium was co-treated with AGE-albumin, the expression level of Bax was decreased (Fig. 3C~G). To check the protective effect of sRAGE secreting UCBMSC, cresyl violet staining was employed. The number of neuronal cells in CS was decreased from around 791±47 cells in the control group to 654±39.4 in the PD mice. After sRAGE secreting UCB-MSC treatment, cells were dramatically increased to 717±21.5, which was similar to control (Fig. 4A). There were significant differences in survival cell numbers between with or without sRAGE secreting UCB-MSC treatment in PD mice (Fig. 4B). To check the protective effect of sRAGE secreting UCB-MSC, immunohistochemistry and TUNEL staining were also employed in PD mice with or without sRAGE secreting UCB-MSC treatment. The expression of RAGE increased PD mice in CS compared to the control group. However, the expression was decreased after treatment with sRAGE secreting UCB-MSC (Fig. 4C). TUNEL positive cells were also decreased after sRAGE secreting UCB-MSC treatment compared to no-treatment in PD mice (Fig. 4D). To examine the anti-inflammatory effects, activated microglial cells were stained by immunohistochemistry. 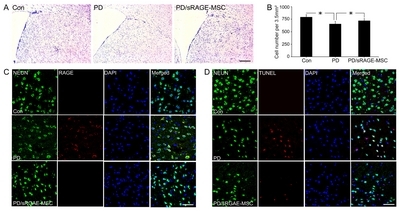 The number of activated microglial cells were increased in PD mice brain, however, decreased dramatically after sRAGE secreting UCB-MSC treatment in PD mice (Supplementary Fig. S3). To examine changes in the movement ability, Rotarod and Pole tests were performed. Firstly, mice were placed on the rotarod machine and they were tested in the continuous speed. The average maintaining times were recorded as 65.54±10.73, 29.30±13.48, and 58.19±18.70 seconds for Control, PD, and sRAGE secreting UCB-MSC treated PD respectively (Supplementary Fig. S4A). Control group has the highest average maintaining time and PD group was recorded as the lowest. The movement ability was increased by treating sRAGE and sRAGE secreting UCB-MSC to mice. sRAGE secreting UCB-MSC treated group showed higher behavioral recovery than the PD condition. Recovery of animal behavior was measured also by Pole test. The time costs were measured for four different groups of animals; Control, PD, sRAGE treated PD and sRAGE secreting UCB-MSC treated PD groups. From each group, 10 mice were tested and the average maintaining time was measured in seconds. The result was shown as 5.00±1.20, 6.06±1.40, and 3.56±0.44 for Control, PD, and sRAGE secreting UCB-MSC PD groups respectively. The average time was increased in PD compared with control groups, which states that the behavior ability was dropped. However, when the sRAGE and sRAGE secreting UCB-MSC was treated, the behavioral ability was improved (Supplementary Fig. S2B). This study was performed to investigate whether sRAGE secreting UCB-MSC can better protect neuronal cell death compared to sRAGE protein in CS and SN of PD animal models. Since the sRAGE is the extracellular domain of RAGE, which is a key molecule for apoptosis, it can bind with ligands such as AGE, or S100 etc. Therefore, sRAGE can block binding such molecules to RAGE on the target cells (11–15). It has been reported widely, when the ligands of RAGE bind on the RAGE of target cells, they become apoptotic and lead to death eventually in several different organs (13, 16–19). We recently published AGE-albumin is one of the main causes of PD (11, 15). 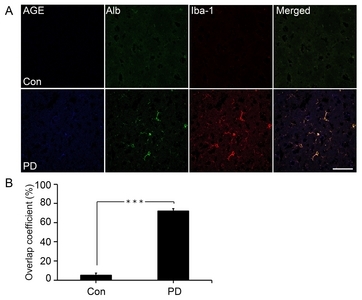 Inhibition of AGE-albumin by sRAGE can protect neuronal death in PD mice. This showed AGE-albumin and RAGE is important molecules in PD treatment. sRAGE secreting UCB-MSC was generated by CRISPR/Cas9 system. CRISPR/Cas9 system has several advantages compared to other gene editing tools. The most remarkable advantage is its simplicity and efficiency. Generation of gRNA was done by manipulating guide sequence which is around 20 nucleotides long. In addition, CRISPR/Cas9 gives less toxicity compared with other gene editing system; ZFN. Also it has been known that CRISPR/Cas9 has minimum off-target effect, therefore, less damaged cells can be prepared (20–29). sRAGE secreting UCB-MSC has many advantages compared to sRAGE protein or UCB-MSC. When the cells secret the sRAGE proteins continuously, sRAGE lasts a longer time than the normal recombinant protein or UCBMSC in the injection site. Therefore, sRAGE secreting UCB-MSC was generated and the secretion level was measured by western blotting. The secretion level was very high in the first passage after transfection, and it decreased dramatically followed by transferring cells. Due to this feature, the only first passage after transfection was used for the treatment of PD animal model. There are several reports showing the relationship with AGE-albumin and various brain degenerative diseases such as Alzheimer’s disease (AD), alcoholism, and PD. For example, Byun et al. showed that AD also has RAGE and sRAGE dependent cell death (18). In the case of AD, when chronic condition occurred in the brain, AGE-albumin was formed by activated microglia and finally it approaches the target cells and neurons become apoptosis following by AGE-RAGE dependent neuronal degeneration (30–33). In this study, PD animal models have a high accumulation of AGE-albumin and result in neuronal death by AGE-RAGE binding in the CS area. sRAGE secreting UCB-MSC showed the strongest performance compared to other groups. Therefore, the continuous blocking the AGE-RAGE binding by sRAGE secreting UCB-MSC revealed as the better therapeutic potential to protect neuronal cells against apoptosis. To determine the changes of the main signaling pathway, we investigated MAPK pathway with or without sRAGE secreting UCB-MSC in PD mice. 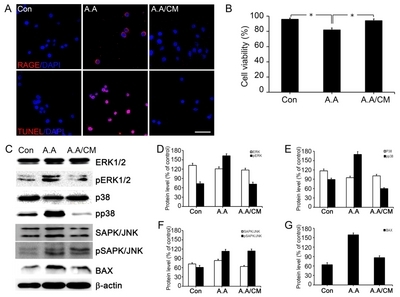 As a result, p38, Erk1/2, and JNK proteins are revealed as contributors for cell death. This result was similar to AD and alcohol-induced brain damage (11, 18, 19). There are some minor issues to improve the CRISPR/Cas9 transfection into UCB-MSC for better sRAGE secreting cell generation. Firstly, the transfection rate was relatively high but the integration rate was low. Therefore, as the result presented, the secretion level keeps decreasing and finally dismissed. Another issue might be the immune rejection. After transplantation, UCB-MSC face immune rejection from the host. If these issues are solved, this would be one of decent therapy to recover against PD. In conclusion, AGE-RAGE dependent cell death contributes to neurodegeneration of both CS and SN of PD when the chronic condition was continued. Therefore, sRAGE secreting UCB-MSC can be one of the good therapeutic approaches to cure PD against neuronal cell death by inhibiting AGE-RAGE binding (Fig. 5). This study was supported by a National Research Foundation (NRF) grant (2017R1A2A2A01005212, NRF-2017M3A9B4028208, NRF-2017M3A9B4061408) and Korea Health Technology R&D Project through the Korea Health Industry Development Institute (KHIDI), funded by the Ministry of Health & Welfare, Republic of Korea (HI13C2098). Fig. 1. Distribution of co-localized AGE-Albumin in activated microglial cells in the striatum of mouse PD model. (A) Triple immunostaining of AGE (blue), Albumin (green), and Iba1 (red, activated microglial cell marker) in the striatum of control and mouse PD model (n=3). Merged image shows that AGE, ALB, and Iba1 were co-localized mostly in striatum area of mouse PD brain. The fluorescence expression level (B) and co-localization coefficient analyzed by densitometric analysis software using Zen software. Scale bar=50 <italic>μ</italic>m. ***p<0.001. Fig. 2. Generation and characterization of sRAGE secreting UCB-MSC. (A) The illustration picture represents the gene information of pZDonor-AAVS1 puromycin vector. Each arrow describes certain gene. (B) The illustration of the sRAGE insertion coding sequence. (C) Genome integration was confirmed by Junction PCR with genomic DNAs of UCB-MSCs which were transfected with mock, GFP and sRAGE containing pZDonor-AAVS1 plasmids. (D) Immunoblot analysis of supernatant and extract from UCB-MSC cells transfected with mock (lane 1) and FLAG-tagged sRAGE in pZDonor-AAVS1 vector (lane 2). <italic>β</italic>-actin loaded as a positive control. The secretion of human sRAGE levels (E) was confirmed with ELISA. ***p<0.001. Fig. 3. 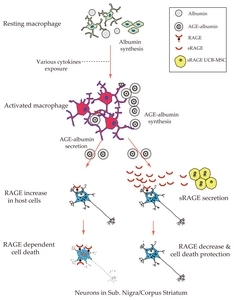 Protective effect of sRAGE secreting UCB-MSC on AGE-albumin induced neuronal cell death by decreasing RAGE level. (A) RAGE expression is shown in double-labeled confocal images RAGE (red) and DAPI (blue) using neuronal (SHSY-5Y) cell before and after exposing AGE-albumin or co-treated with AGE-albumin and sRAGE secreting UCB-MSC conditioned medium. Neuronal death was evaluated by double staining TUNEL (red) and DAPI (blue). Scale bar=50 <italic>μ</italic>m. (B) Cell activity and viability were determined using the MTS assay. (C) Immunoblot analysis of neuronal cell lysates after AGE-albumin or AGE-albumin with sRAGE secreting UCB-MSC conditioned medium co-treatment. (D~G) Densitometry analyses of MAPK proteins were evaluated using the Image-J software. Each experiment was performed in triplicated and repeated three times. *p<0.05. Fig. 4. Protection against neuronal death by sRAGE secreting UCB-MSC in a PD model. (A) Cresyl violet staining of control, PD, and sRAGE secreting UCB-MSC treated PD mouse brains showing the population changes of neuronal cells in control (n=3), rotenone-treated (n=3), rotenone with sRAGE secreting UCB-MSC treated groups(n=3). (B) The neuronal population was reduced in rotenone-treated animals, however, the population increased in rotenone with sRAGE secreting UCB-MSC treated group. Scale bar=200 <italic>μ</italic>m. (C) Double immunostaining of RAGE (red) or NEUN (green) in control, rotenone-treated, rotenone with sRAGE secreting UCB-MSC treated groups. Double labeling increased in rotenone-treated animals, however, the labeling decreased in rotenone with sRAGE secreting UCB-MSC treated group. (D) Neuronal death was evaluated by triple staining NEUN (green), TUNEL (red) and DAPI (blue). The TUNEL signal increased in rotenone treated animals but it decreased in rotenone with sRAGE secreting UCB-MSC treated group. Scale bar=50 <italic>μ</italic>m. *p<0.05. Fig. 5. A proposed model of AGE-albumin mediated neuronal cell death and its protection in PD. The schematic diagram illustrates the synthesis in microglial cells and extracellular secretion of AGE-albumin, which induces neuronal cell death and ultimately contributes to neurodegeneration. AGE-albumin synthesis and secretion in microglial cells are increased in PD models. sRAGE secretion from sRAGE UCB-MSC can protect AGE-albumin induced neuronal death in PD. Taken together, AGE-albumin promotes the death of primary neuronal cells and sRAGEMSC treatment can protect the pathobiology of PD. Kyunghee Byun and Bonghee Lee designed the study and wrote the manuscript. Jaesuk Lee, Delger Bayarsaikhan, Jaewon Lee, Roshini Arivazhagan and Peter Gwak performed the experiments. Hyejung Park, Byungyoon Lim and Goo-Bo Jeong interpreted and analyzed the data. Kyunghee Byun and Bonghee have approved the version to be submitted and were responsible for data acquisition and analysis. All authors reviewed the manuscript. Supplementary data including four figures can be found with this article online at http://pdf.medrang.co.kr/paper/pdf/IJSC/IJSC-12-s18110.pdf. Walker Z, Possin KL, Boeve BF, Aarsland D. Lewy body dementias. Lancet 2015;386:1683-1697. Castellani R, Smith MA, Richey PL, Perry G. Glycoxidation and oxidative stress in Parkinson disease and diffuse Lewy body disease. Brain Res 1996;737:195-200. Münch G, Lüth HJ, Wong A, Arendt T, Hirsch E, Ravid R, Riederer P. Crosslinking of alpha-synuclein by advanced glycation endproducts--an early pathophysiological step in Lewy body formation?. J Chem Neuroanat 2000;20:253-257. Cepeda IL, Flores J, Cornfeldt ML, O’Kusky JR, Doudet DJ. Human retinal pigment epithelial cell implants ameliorate motor deficits in two rat models of Parkinson disease. J Neuropathol Exp Neurol 2007;66:576-584. Przedborski S. Pathogenesis of nigral cell death in Parkinson’s disease. Parkinsonism Relat Disord 2005;11 Suppl 1:S3-7. Chen Z. Cell Therapy for Parkinson’s disease: new hope from reprogramming technologies. Aging Dis 2015;6:499-503. Fu MH, Li CL, Lin HL, Chen PC, Calkins MJ, Chang YF, Cheng PH, Yang SH. Stem cell transplantation therapy in Parkinson’s disease. Springerplus 2015;4:597. Lindvall O. Treatment of Parkinson’s disease using cell transplantation. Philos Trans R Soc Lond B Biol Sci 2015;370:20140370. Przedborski S. Inflammation and Parkinson’s disease pathogenesis. Mov Disord 2010;25 Suppl 1:S55-57. Damien P, Allan DS. Regenerative therapy and immune modulation using umbilical cord blood-derived cells. Biol Blood Marrow Transplant 2015;21:1545-1554. Bayarsaikhan E, Bayarsaikhan D, Lee J, Son M, Oh S, Moon J, Park HJ2, Roshini A2, Kim SU4, Song BJ5, Jo SM6, Byun K3, Lee B3. Microglial AGE-albumin is critical for neuronal death in Parkinson’s disease: a possible implication for theranostics. Int J Nanomedicine 2016;10 Spec Iss:281-292. Kalea AZ, Schmidt AM, Hudson BI. Alternative splicing of RAGE: roles in biology and disease. Front Biosci (Landmark Ed) 2011;16:2756-2770. Son M, Kang WC, Oh S, Bayarsaikhan D, Ahn H, Lee J, Park H, Lee S, Choi J, Lee HS, Yang PC, Byun K, Lee B. Advanced glycation end-product (AGE)-albumin from activated macrophage is critical in human mesenchymal stem cells survival and post-ischemic reperfusion injury. Sci Rep 2017;7:11593. Son M, Oh S, Park H, Ahn H, Choi J, Kim H, Lee HS, Lee S, Park HJ, Kim SU, Lee B, Byun K. Protection against RAGE-mediated neuronal cell death by sRAGE-secreting human mesenchymal stem cells in 5xFAD transgenic mouse model. Brain Behav Immun 2017;66:347-358. Byun K, Yoo Y, Son M, Lee J, Jeong GB, Park YM, Salekdeh GH, Lee B. Advanced glycation end-products produced systemically and by macrophages: a common contributor to inflammation and degenerative diseases. Pharmacol Ther 2017;177:44-55. Schmidt AM, Yan SD, Yan SF, Stern DM. The multiligand receptor RAGE as a progression factor amplifying immune and inflammatory responses. J Clin Invest 2001;108:949-955. Bucciarelli LG, Wendt T, Rong L, Lalla E, Hofmann MA, Goova MT, Taguchi A, Yan SF, Yan SD, Stern DM, Schmidt AM. RAGE is a multiligand receptor of the immunoglobulin superfamily: implications for homeostasis and chronic disease. Cell Mol Life Sci 2002;59:1117-1128. Byun K, Bayarsaikhan E, Kim D, Kim CY, Mook-Jung I, Paek SH, Kim SU, Yamamoto T, Won MH, Song BJ, Park YM, Lee B. Induction of neuronal death by microglial AGE-albumin: implications for Alzheimer’s disease. PLoS One 2012;7:e37917. Byun K, Bayarsaikhan E, Kim D, Son M, Hong J, Jeong GB, Paek SH, Won MH, Lee B. Activated microglial cells synthesize and secrete AGE-albumin. Anat Cell Biol 2012;45:47-52. Wang H, La Russa M, Qi LS. CRISPR/Cas9 in genome editing and beyond. Annu Rev Biochem 2016;85:227-264. Chang CY, Ting HC, Su HL, Jeng JR. Combining induced pluripotent stem cells and genome editing technologies for clinical applications. Cell Transplant 2018;27:379-392. Komor AC, Badran AH, Liu DR. CRISPR-based technologies for the manipulation of eukaryotic genomes. Cell 2017;168:20-36. Hendriks WT, Warren CR, Cowan CA. Genome editing in human pluripotent stem cells: approaches, pitfalls, and solutions. Cell Stem Cell 2016;18:53-65. Ceasar SA, Rajan V, Prykhozhij SV, Berman JN, Ignacimuthu S. Insert, remove or replace: a highly advanced genome editing system using CRISPR/Cas9. Biochim Biophys Acta 2016;1863:2333-2344. Gaj T, Gersbach CA, Barbas CF 3rd. ZFN, TALEN, and CRISPR/Cas-based methods for genome engineering. Trends Biotechnol 2013;31:397-405. Tycko J, Myer VE, Hsu PD. Methods for optimizing CRISPR-Cas9 genome editing specificity. Mol Cell 2016;63:355-370. Chandrasegaran S. Recent advances in the use of ZFNmediated gene editing for human gene therapy. Cell Gene Ther Insights 2017;3:33-41. Renaud JB, Boix C, Charpentier M, De Cian A, Cochennec J, Duvernois-Berthet E, Perrouault L, Tesson L, Edouard J, Thinard R, Cherifi Y, Menoret S, Fontanière S, de Crozé N, Fraichard A, Sohm F, Anegon I, Concordet JP, Giovannangeli C. Improved genome editing efficiency and flexibility using modified oligonucleotides with TALEN and CRISPR-Cas9 nucleases. Cell Rep 2016;14:2263-2272. Luo Y, Rao M, Zou J. Generation of GFP reporter human induced pluripotent stem cells using AAVS1 safe harbor transcription activator-like effector nuclease. Curr Protoc Stem Cell Biol 2014;29:5.A.7.1-18. Münch G, Westcott B, Menini T, Gugliucci A. Advanced glycation endproducts and their pathogenic roles in neurological disorders. Amino Acids 2012;42:1221-1236. Perry VH, Nicoll JA, Holmes C. Microglia in neurodegenerative disease. Nat Rev Neurol 2010;6:193-201. Vasan S, Foiles PG, Founds HW. Therapeutic potential of AGE inhibitors and breakers of AGE protein cross-links. Expert Opin Investig Drugs 2001;10:1977-1987. Walker DG, Lue LF. Investigations with cultured human microglia on pathogenic mechanisms of Alzheimer’s disease and other neurodegenerative diseases. J Neurosci Res 2005;81:412-425.